Part 2 of my interview with Meredith Quartermain, whose new short story collection, I, Bartleby, launched April 23rd. RS: What examples in literature, and in the world of text, did you turn to when writing these stories? I’m thinking here of those mentioned outright in titles and story-references such as Christine Stewart, Malcolm Lowry, Robert Walser (e.g. The Dinner Party), Robin Blaser, Pauline Johnson, and many others (including W.G. Sebald, of whom many speak, but I’ve not yet read)…but also those sensed beneath the surface…page-haunters, if you will: Proust, Gertrude Stein, as well as Lydia Davis, perhaps even Fred Wah, In Diamond Grill!? (for instance, in the way that the first line of each story is also, in part, its title). Syntax, chiseled to perfection, allows your stories to flow as if seamlessly from the tangle and specific to the meta-fictional and perhaps even, to the meta-physical! MQ: About 10 or 12 years ago I discovered the work of Swiss writer Robert Walser. The philosopher Giorgio Agamben praised Walser highly, so I began reading his work, which includes several novels and many short pieces that seem to blend autobiography and poetry with fiction – playful, musing pieces, sometimes very poignant, sometimes quite poetic. Walser was also highly regarded by Franz Kafka and Robert Musil, and he has some of the same droll irony in his work as those writers. I read everything I could get by Walser, and this reading led to my book Recipes from the Red Planet, a collection of short narratives that run the gamut from prose poems to flash fiction. The formal possibilities opened by Walser and other writers mentioned above gave me the widest possible scope for short narrative. However, more recently I immersed myself in the work of W.G. Sebald, a marvelous writer who seamlessly blends autobiography with fiction and essay. For instance his Rings of Saturn: An English Pilgrimage makes a Suffolk walking tour into an episodic novel, exploring encounters with people and places along the way, as well as historical connections to the landscape. These opened the way for the more autobiographical pieces in I, Bartleby, such as “Scriptorium” and “Moccasin Box” (which follows Sebald’s practice of including photographs counterpointing the text). I also read the whole of Proust’s In Search of Lost Time, which describes itself as part novel, part essay. And yes, the short quirky narratives of Lydia Davis have been crucial to my imagination of formal possibilities. Her novel The End of the Story is an amazing blend of autobiography, fiction and metafiction. RS: There is a vast expanse to I, Bartleby and the book is “only” 112 pages of “story.” Can you share your thoughts about how these stories took shape (their form)? MQ: The working title for I, Bartleby was the Handwriting Project. Robert Walser (1878-1956) worked among other things as a copyist, copying out documents by hand. He was particular about handwriting. He didn’t revise his pieces. He just wrote them as they came to him, paying careful attention to making his handwriting as fine as possible. I began writing pieces only cursively, experimenting with double size and tiny script. I have terrible handwriting; I often can’t read it. I forced myself to slow down and focus on making my handwriting graceful and legible – a hopeless task. But the focus shifted something in my consciousness. The slowness of the writing speed opened all sorts of poetic digressions along the path of the writing, and these amazed me. I failed completely at elegant handwriting, and I certainly did cross things out and revise. But I also found many things I didn’t know were in me. Since I live very near to Vancouver’s Chinatown, I had often thought I should try to learn some Chinese written characters so at least I could read the signs in the shops. Okay, that was a bit ambitious. I got as far as baby books showing how to write characters for men, sea, cat, etc. I practiced them until I could write them from memory and, since my project was making marks by hand on paper, I got some ink and a brush and learned to write these characters calligraphically. Elegant they were not. But the pictorial possibilities in their shapes led to the second series of pieces in the book. The project then broadened to consider not only the physical act of handwriting but also the handwriting practices of other writers such as Christine de Pizan, monks in medieval monasteries, and of course Melville’s famous copyist Bartleby, the Scrivener. What, I asked, were the writing practices of Malcolm Lowry, Pauline Johnson and Ethel Wilson – my forebears in this coastal, colonized, mountain and river-delta place on the far edge of North America? RS: Pauline Johnson and Stanley Park: both seem to exert over writers a kind of magnetic pull: in “Moccasin Box,” we read a multi-strand narrative that is part journalism, part prose poem (see page 98 for one of the most beautiful landscape-poems of north Vancouver that I’ve ever read), and also a kind of personal witness, its last line, which closes the book, devastating. How long did you research this piece and any surprise discoveries, particularly items that didn’t make it into the book? MQ: “Moccasin Box” was originally twice as long. I read several biographies of Johnson as well as her Legends of Vancouver which retells stories told to her by Chief Joe Capilano of the Squamish First Nation. I wanted to hear stories that had come specifically from the mountains and the sea in this coastal place where I wandered, not the stories that had been imposed by colonization. I read all the Squamish legends I could find in various editions. But who had recorded these stories? Often it was white settlers like the amateur anthropologist Charles Hill-Tout or the renowned anthropologist Franz Boas. What did their filtering mean about the stories I was reading? This led to extensive reading about how Boas and Hill-Tout practiced head measuring in their forays into local first nations communities. In Hill-Tout’s case, the community completely rebelled. I looked at pictures of craniometers and how head measurements had been used by police to classify criminals. I considered Hill-Tout’s excavations of the Musqueam village site, he called the great midden, and his sales of Musqueam bones and artifacts to the Provincial Museum. I wanted all this misreading and cultural invasion to be visible somehow in this piece. But it was too much, so I narrowed the piece to focus more on Pauline Johnson, her writing practice, and my personal search for her in the park that she loved. RS: The essay-story about Malcolm and Margerie Lowry deepens my sense of I, Bartleby as a companion volume to Vancouver Walking and I love how this piece is part of the section titled, “How to write” with its extended meditation on the meta-fictional and surreal qualities of “real” and “fictional” lives. Several years ago, during the writing of Children of Air India, I ventured to SFU Burnaby, by Skytrain and bus, to hear Michael Turner’s presentation/exhibition on “expanded literary practices” in Vancouver from 1954-1969 and on the walls of his curated space, found a giant reproduction of “Journal of a Voyage” by Malcolm Lowry, that would appear in The Paris Review 23. Did you happen to encounter Michael Turner’s essay “to show, to give, to make it be there” while researching the Lowry letter archive? MQ: I did not see this essay while I was researching the Lowry archive, but I’ve looked at the version of it posted on Websit Blog in 2009. Turner’s remark that “the shape of Malcolm Lowry’s ‘Through The Panama’ was more likely a result of the author’s early demise than anything he might have intended” doesn’t make sense to me. Lowry’s “Through the Panama” forms the underpinning of “The Real Fictional House of His Imagined Film Director” in I, Bartleby. The Panama piece is from Lowry’s collection Hear Us O Lord From Heaven Thy Dwelling Place, which the publisher tells us was quite complete at the time of Lowry’s death; Lowry was merely “putting the finishing touches” on it. The surprising thing about Lowry is how interested in metafiction he was (fiction that writes about the making of fiction), and “Through The Panama” is an outstanding example of this. With all kinds of references to major literary fictions including “The Rime of the Ancient Mariner” and the great French metafictionalist Jacques Diderot, Lowry’s “Panama” revels in metafiction; the book is cast as the journal of a Lowry stand-in Sigbjørn who is planning a novel about a character named Martin Trumbaugh (another Lowry stand-in) who becomes enmeshed in the plot of a novel he has written in Mexico (Lowry’s Under the Volcano renamed The Valley of the Shadow of Death). There are many autobiographical motifs in Lowry’s work and one of these that most interested him and also interests me greatly was the story of his own methods of inventing fiction, the story of the life of a composing artist. RS: I read these stories as linked. Are they? MQ: Yes, they are linked around investigations of handwriting, the practices of various writers, and my own life experiences to do with writing. A second thread linking several of the stories has to do with Chinatown, Chinese written characters, and my father’s Chinese cooking and fascination with things Oriental. There are also microlinkages between clusters of stories, for instance around the motif of camels in the desert, or the motif of family relations. An abiding concern too is the real vs the fictional. How is the fiction we call reality different from the fiction we call fiction? My research in the Lowry archive specifically focused on how Malcolm and Margerie (a novelist who published three of her own novels and who significantly altered the fiction in Under the Volcano) fictionalized their lives. MQ: The book opens with the first two sections (“Caravan” and “Orientalisme“) in the order that I wrote them. I’m very much indebted to my editor M.A.C. Farrant for leading me to the order of the sections after that and for encouraging me to strengthen the link to Bartleby explicitly in each section so that this figure of silence and stubborn refusal would haunt the book. That restructuring led also to moving a short piece from “Caravan” to the “Scriptorium” section, and moving a short piece from “How to Write” to the “Moccasin Box” section. Stay tuned for Part 3, forthcoming next week. 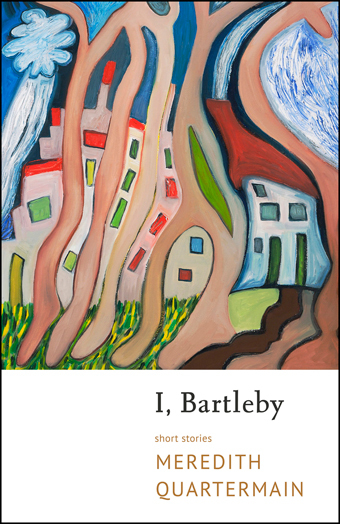 I, Bartleby is now available. Cover image featured with permission from Meredith Quartermain.